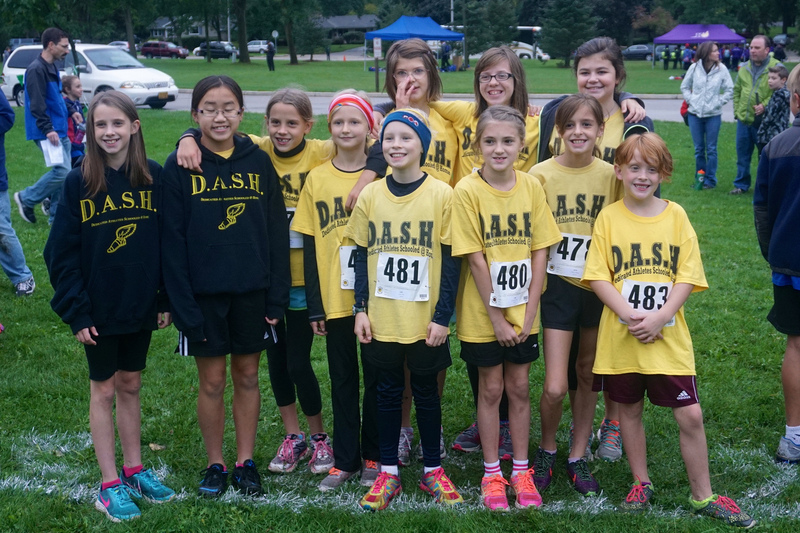 The DASH team completed another season Friday, running at Greenfield Park in the Grade School Challenge. This is an end of season all-star meet that we have not competed in since 2012. This year we were back bringing 11 of our best runners. Our team was very young for this 8th grade and under format, and the competition included most of the best teams from the area, some traveling over 60 miles to compete. It would be a true challenge for our young all-stars, and a chance to see how we stack up against the toughest middle school competition found anywhere in the state this year. The girls race was first. Our DASH girls found themselves in the middle of the action as they lined up in box 21 of the 40 boxes. Joy Rasch took a spill at the start. She got back up quickly with some help from Savanna, and the race was on. Stephanie Chu made it through the first loop in 35th place by Mr. Beck’s count, and that is exactly where she ended up at the finish. Stephanie’s mile pace was under 7 minutes, yet that still left 34 athletes in front of her. This was definitely all-star racing with Stephanie being one of the stars. Julianna Caspers got off the starting line late and found herself in heavy traffic the whole way. The field in all-star meets does not spread out like it does in normal meets. Julianna finished with a respectable time of 12:54 over the 1.75 mile course. Julia Kowalinski stayed close to Julianna again this time, staying just 16 seconds back. Those 16 seconds left her 14 runners behind Julianna for 81st place. The racing was very tight. Heidi Talbert was our 4th scorer, and put together a very impressive race. She hit the finish in 13:44. Joy Rasch, after her early spill, got up and competed well, yet finished in 142nd place. Savanna Bruton was not at her best this time, falling behind the other girls. Hopefully she will get a few more chances at this meet in the coming years. The girls finished in 14th place overall which is pretty good for such a young team. The boys were next, and their race would be even more competitive. Our boys lack a true number 1, so the goal would be to have our top-4 all staying close, and pushing each other to some good times. Kaden Hacker was a late scratch, so our top-4 would all have to bring their best for us to score well. After the first loop the boys were all together as we hoped. Leif Kostrzewa was the first to come out of the woods with Joshua LeSac eventually chasing him down before the finish. Nathanael Chu and Alexander Taylor came out of the woods only a few seconds behind. Joshua finished in 11:41, and all the boys stayed within 7 seconds of each other. It was just what we had hoped they would do, and their times were very good, but that still left us in 18th place in the team standings out of the 25 teams that scored. We could not match the other teams’ number 1 runner this time, but we scored only one 8th grader. We have a chance to really move up in the standings in the years ahead. Daniel Caspers gave us a little insurance in taking Kaden’s roster spot. He made it through the course and got himself a t-shirt for his efforts. Overall, the boys ran very well and gained some valuable all-star experience. Thanks to Mr. Beck for his help with the coaching. Thanks to Wisconsin Lutheran College for hosting another great meet, and setting up a very nice course. Thanks to the camera lady for getting the photos once again. The boys race was particularly challenging for her with the boys running so close together. 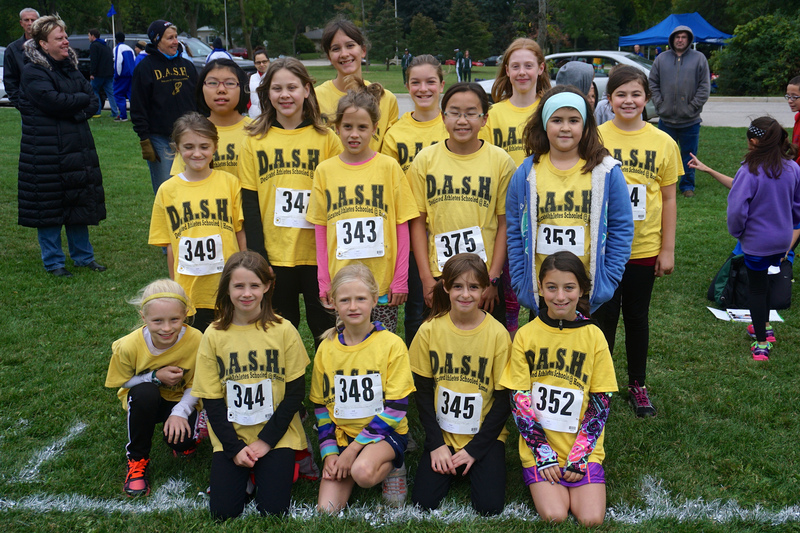 We made it through another great DASH season. The days are getting shorter now, and it is time to put the DASH Blog to rest for awhile and get down to some serious studying. We ramp it up again the first week of March for track. I hope to see you there. 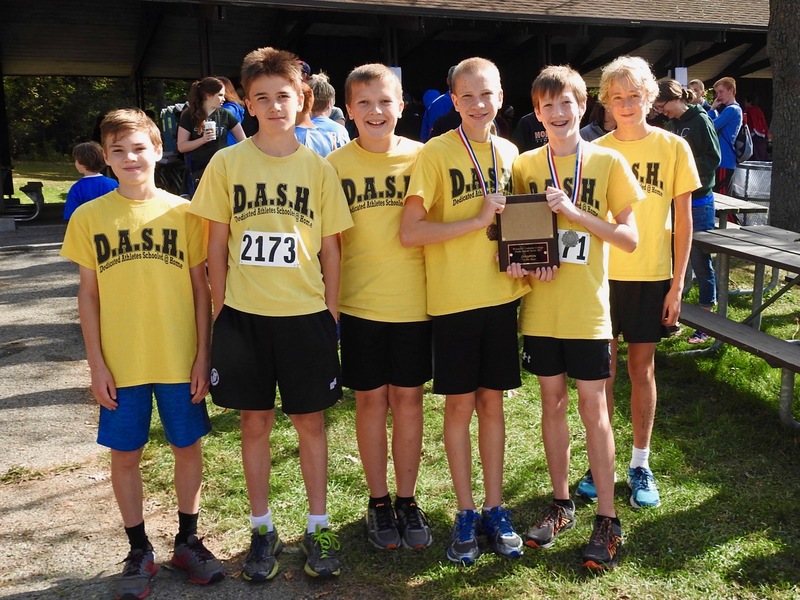 On Wednesday, the DASH middle school cross country team was running up in Jackson again at Kettle Moraine Lutheran High School. This meet used to be small in the old days, but it has grown now to the point to where over 600 athletes would be crossing the finish line. Twenty of those athletes would be wearing DASH yellow. It would be the last meet of the season for half of our athletes, and they had a beautiful day to try to finish the season strong. They changed the format this year into a varsity/JV format like we see at high school meets. The JV runners would be first and run the 2500 meter course. For the girls, Alexa Bruton started off conservatively, but she made her move in the loop around the track and was our first girl up the hill. She hit the finish in 14:06 and really impressed the DASH fans with her effort. Mary LeSac had a personal record this time on a course she has run many, many times. It was a good way to end the season for Mary. Hellena Hacker moved up to finish right behind Mary. Hellena always looks good at the end of a race. Jenna Walters improved her time from last week on the same course. Our JV girls ran well. Our JV boys were next, and they were not as little. Daniel Caspers raced around the 2500 meter course in 11:54 for 32nd place. He looked to be just as fast in the fun run later. Joshua Lipski finished 46th this time out. Both times this year he has run very well on this course. Micah Chan cut off 41 seconds from his time last week. He stayed behind Noah until the final loop, and then surged ahead and broke 13 minutes. Noah Caspers keeps cutting off a minute from his time each race. He has turned out to be much better than advertised. Noah left 84 athletes behind him this time with his 64th place finish. The varsity girls would be next. It would be the first time this season that Stephanie Chu would be running for more than just an individual medal. Stephanie still did add another medal to her collection with her 9th place finish as she raced around the 3200 meter course in 14:35, but this time she had five other girls backing her up looking to post a nice team score. Julianna Caspers enjoyed chasing after Stephanie, and gave us a second top-20 finish. Her 15:04 was good for 18th. Heidi Talbert slowed a little in the middle of the long course, but finished strong to catch Savanna Bruton just before the finish to be our 3rd scorer. Savanna had also been moving up near the end of the race, getting ahead of Heidi in the last loop, and really impressed everyone with her effort. Her 16:29 time was good for 52nd, two spots behind Heidi. Joy Rasch ran a very smart, steady race. The distance did not effect Joy, or the other girls, as much as I though it might. Joy gave us a 5th girl in the top-62. Grace Caspers had her best race of the season as she stayed close to our top-5, finishing in 72nd place. Our young girls team took 7th overall in the team scores. They are really peaking now at the end of the season. We would be fielding a very strong boys varsity team. Our boys have been running very close this year, and it would be interesting to see their order of finish once again. Leif Kostrzewa went out really fast, but then fell in the woods through the first loop. He got up and ran with Nathanael Chu the rest of the way, but it was Nathanael who was first to the finish line. Nathanael just never slows down, and was able to work his way into a top-25 finish before he was done. Leif finished five seconds back of Nathanael with his fast 13:47 time, good for 29th place. Kaden Hacker ran another strong race and could be seen coming down the hill to the finish behind Nathanael and Leif. Kaden broke 14 minutes through the 3200 meter course and gave us a third runner in the top-34. Alexander Taylor was next, running hard to the finish in 14:25. A dirty Joshua LeSac was next with a disappointing 15:01. Joshua had taken a spill in the middle of the race, and had trouble the rest of the way. Seka Kostrzewa was needed to run with the big guys this time, and posted a nice 15:13 time. Only one 4th grade or under athlete came in ahead of Seka. When the team scores were tabulated, we ended up in 6th place, one point out of 5th. We will accept it and look ahead to next Friday’s Grade School Challenge. It was great to see so many of our athletes finishing up their season on a high note. 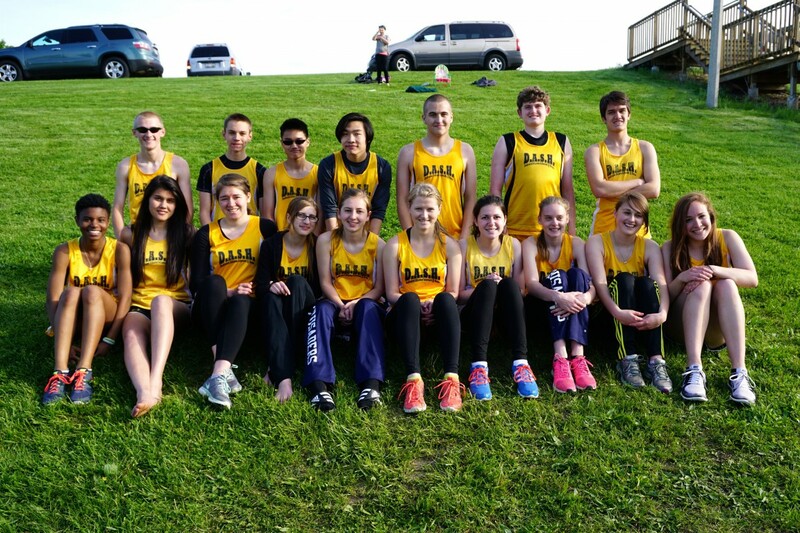 But ten of these athletes, plus Julia Kowalinski, have one more race left to prepare for. We are not done yet. One more week of training before the grand finale at Greenfield Park. I hope to see you there. Thanks to Ed Beck for his help with the coaching, and then going out and taking 2nd overall in the fun run. 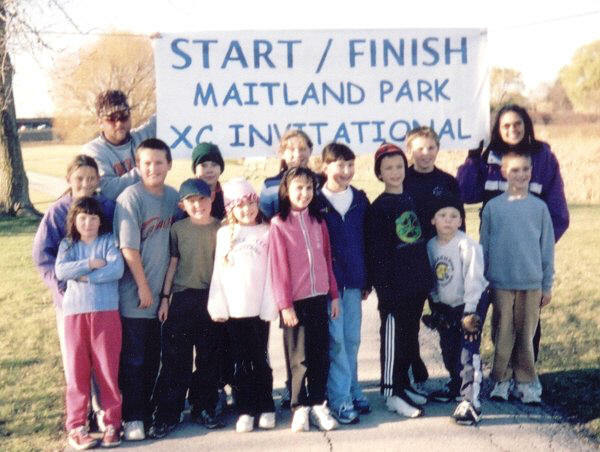 Let’s hope some of these kids can run as fast as Mr. Beck when they are his age. Thanks to the DASH fans for lining the course and cheering the team on. I saw lots of yellow out there. 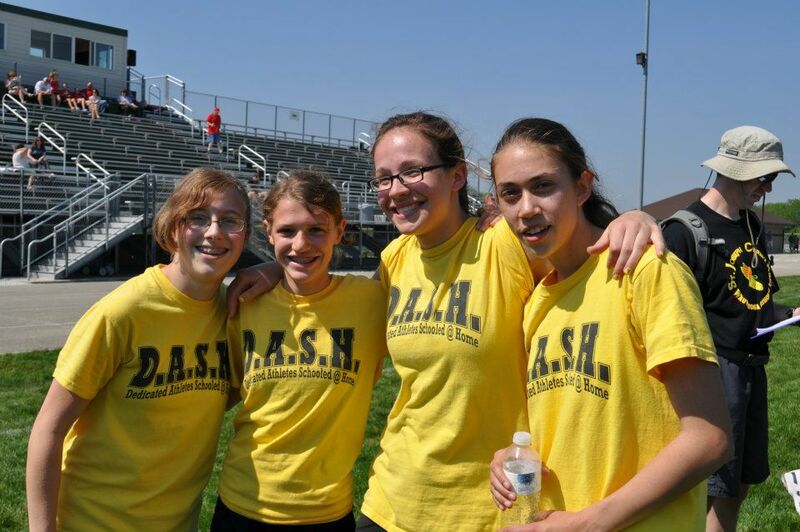 Thanks to the camera lady, along with Jenna Walters and myself during the fun run, for getting the photos. We made it through our big 7 meets in 14 days swing. The end is near for this great DASH season. It is almost time to rest. Almost. 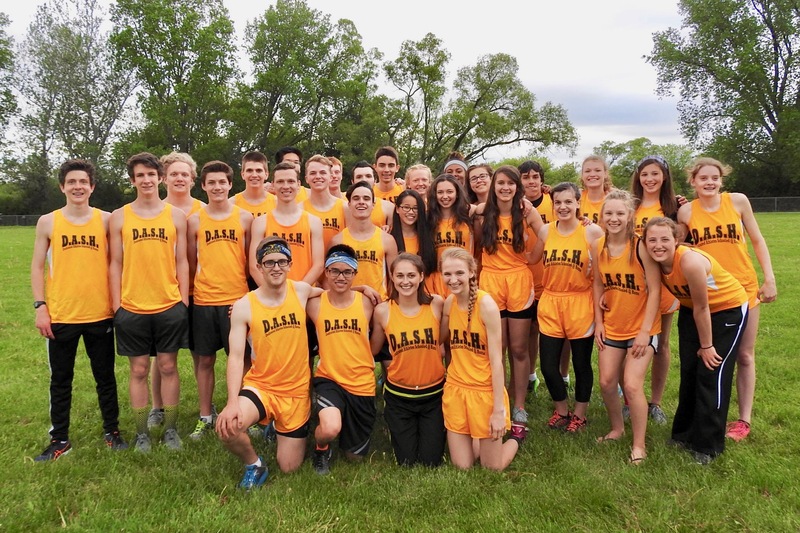 The DASH high school cross country team was in Delafield last Tuesday to run in their final meet of the season, the Lancer Invite, hosted by St John’s NW Military Academy. The temperature was in the upper 60’s and the sun was mostly out. We would be looking for some fast times running the golf course on such a nice day. However, the course when measured turned out to be a little short, so no one would be officially breaking their 5k personal records. That was a disappointment, but the race for the top-3 team trophies was still on. 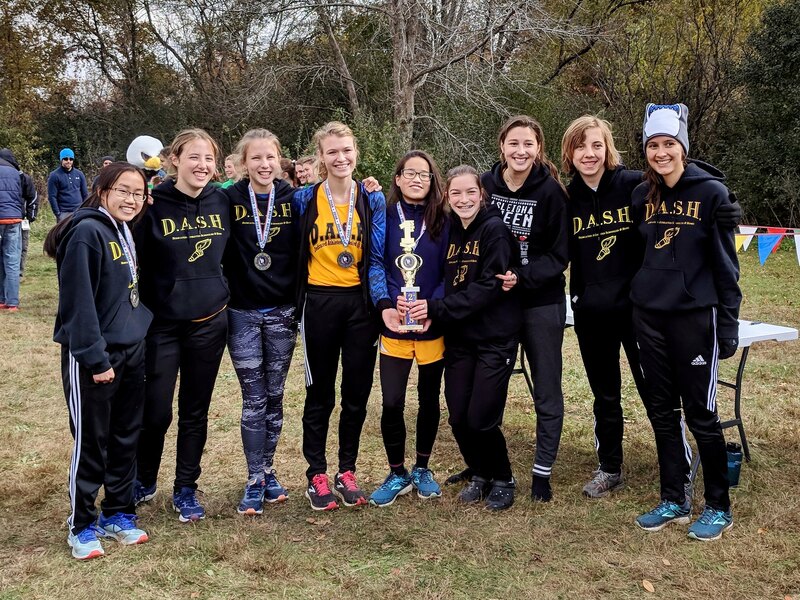 We would have to be at our best to leave with one, or maybe even two trophies, as we wrapped up another great DASH season. The boys varsity squad started the day off this time. Drake Hacker and Samuel Zinkgraf were ready to go for the first time since our second meet, and the decision was made that they would run with the varsity team. When the racing got going, Justin Chu raced out with the leaders as he usually does, and with an inspiring effort stayed in the top-4 the whole way. Justin clocked in at 16:17, and if we had not got an official measurement of the course, his time would have broken the DASH record by .2 seconds. It was great to see Justin finishing on such a high note in his last cross country race. Brian Durbin had his best race of the year. Brian got himself in good position early, stayed steady and strong in the middle, and was moving up before the finish to take 14th overall. So far, so good. Unfortunately, things started to unravel a bit after Brian. Drake Hacker was looking like he definitely was ready to be back running varsity through the first mile, but then someone stepped on the same foot that had the 19 stitches, and a sharp pain shot up his leg. Drake would be done for the day. Freshman Caleb Schaber had not had a bad race all year, but this time his legs felt heavy in the second mile, and he just could not maintain his pace. He fell back in the end to 37th place. We were looking for Joe Maurer and Tim Kowalinski to be running up near Brian as they usually do, but this time they fell off the pace and finished over a minute behind. Samuel Zinkgraf gave us all he had as he always does, and it was not bad as he finished right after Tim, but when the team scores were counted we had fallen to 4th place, just missing a top-3 trophy. It was one of those days for the varsity boys. I think on a good day we could have finished top-2. Next year we try again. The varsity girls were next, and the team got out to the first flag fast. After the race settled down some, Abby Chu and Kayla Bruton paced together through the first half of the course. This time Abby moved ahead and was moving up in the last mile with thoughts of 8th place when she suddenly started limping on her way to the finish line. Abby showed how tough she is as she made it through the course, but she ended up just out of the medals in 11th place, and then she could hardly make it back to our base. She had pulled a tendon attached to her hip and her hip had dislocated. Imagine the pain she was in, and yet she still finished. We need to pray that Abby makes a complete recovery from a scary injury like that. Kayla Bruton ended up with another good race with her 21:50 time, good for 13th. Faith Caspers had another good race and was our third girl in. Kayla Walters kept Faith in her sights this time, and is just rounding into racing form now. Better late than never. Kayla finished three spots behind Faith in 24th place. Rebecca Dickman had a side ache this time, but made it through the course running right behind Kayla. Ella Johnson worked hard as usual and was the next runner in after Rebecca. It was a great first season of cross country for Ella. Jessy Homa had a cold, and it obviously affected her. She picked the right race to be sick, though, as the other girls all came through for us. We ended up with the 3rd place trophy as we should have. Good job, girls. We fielded 12 for the boys JV race. We have never run this many before. Vincent Maurer was a last minute addition to the JV team, and he made sure the coach would never think of doing that again. Vincent got out in front early, and held off all challengers. It was a magnificent run from the freshman. 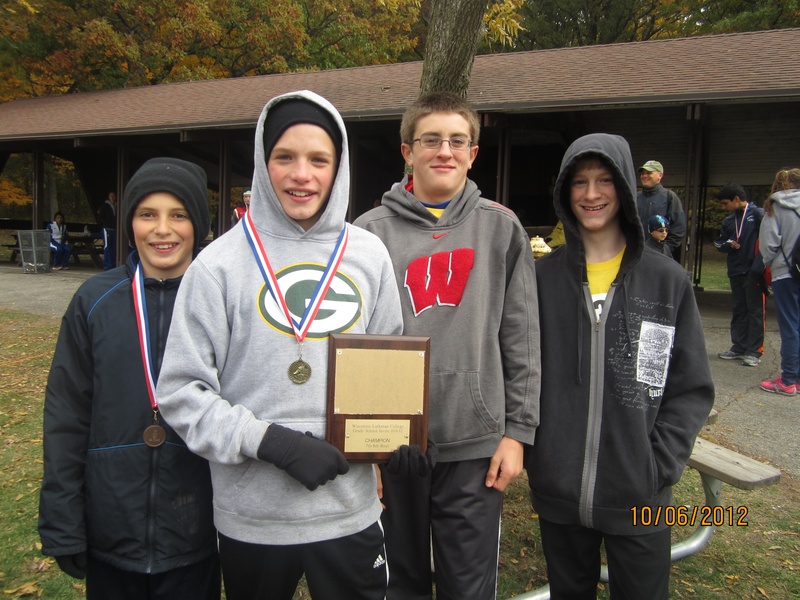 His time of 17:42 would have looked good on our varsity team, but this time it was good for the 1st place JV medal. John Klaves was running 14th with about 2/3 of a mile to go. He then took off as he went by the coach and picked off one athlete after another until he was in 8th place at the finish. That gave us another JV medal. Joshua Schaber had another notable race as he came in 15th with a 19:10. Lucas Ebel brought his little brothers spikes. It did not help as he finished in 20th place, a little farther back than he would have liked. Seth Holter capped off a very impressive first cross country season with his 19:37. He has been very fast, steady, and predictable each time out. Ben Hughes followed closely behind Seth with another good effort. These boys should make it interesting next year as they push for varsity spots. Joshua Anumolu’s leg did not bother him and he ran well and posted a 20:24. Ben Bridge was on hand this time, and really moved up in the last mile to finish in 20:49. Zach Pape looked good for the first two miles, but then tailed off some. Freshman can do that. With work on that last mile, he could be really good next year. Cliff Yang edged Zachary Werner at the line. Both ran well, with the junior coming in ahead of the freshman. Seniority usually wins out in boys races. Miles Talbert got better with each race this year. This time he clocked in at 25:17 on the short course. The JV boys have been impressive all season. They ended up 2nd overall this time. Very nice. 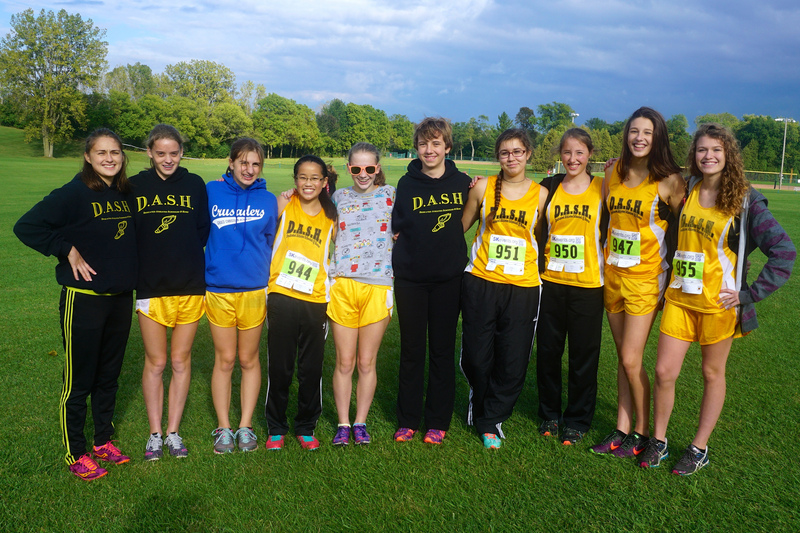 It would be the first time in DASH history we would get a JV girls team score as we ran five. Zipporah Caspers had us picking out and counting the few girls ahead of her. She kept them in her sights on her way to a nice 4th place, medal winning finish. She even had time to spur a few of our JV boys along. It was a fun race from our long-time star, who has won her fair share of hardware in her 11 years with the team. Emma Taylor really looked fast the first half of the race. She tailed off some at the end, but gave us a nice 18th place finish. Alivia Kempf stayed close to Emma the whole way. She made the most of her short season. Katrina Lipski saved her best racing for this meet once again, finishing in 27:30. Alyssa Krug was back racing after being sick the last week. She paced herself easy, and then had a great finish. When the team scores were tabulated, we finished 3rd overall. That beats an incomplete every time. We had our positives this time out. 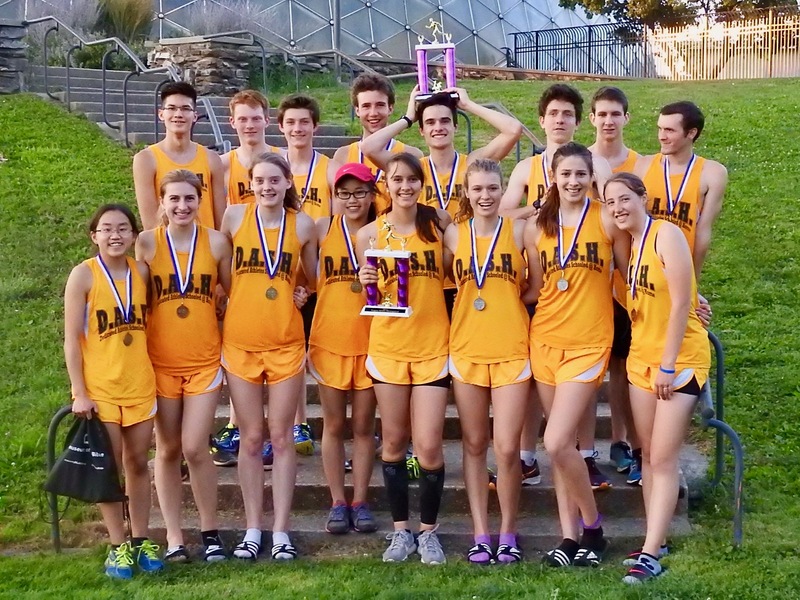 We took home four individual medals, including Vincent’s big JV win, plus we won the 3rd place girls trophy. Unfortunately, they were balanced out by Drake and Abby’s injuries, and I know missing out on a boys team trophy will be bothering me until next year. 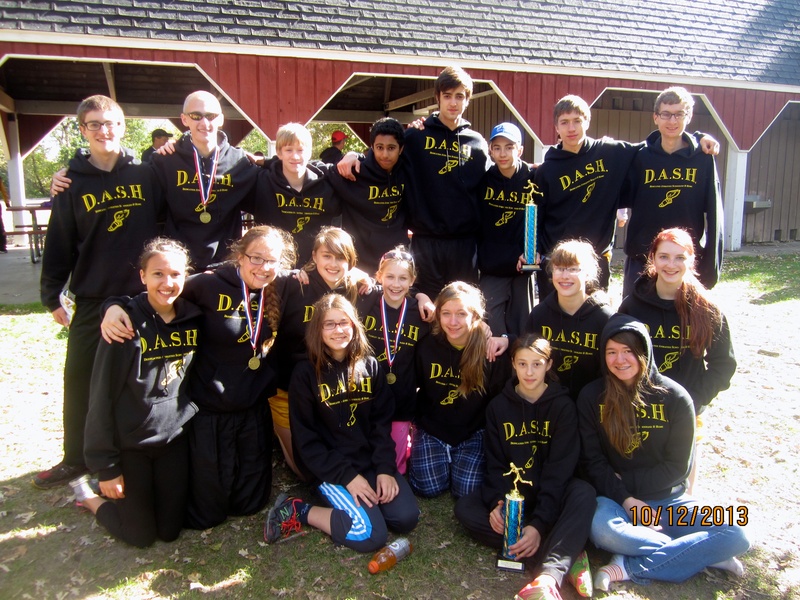 Looking back on the whole year, it was undoubtedly another great, award winning DASH season. This was the hardest working team we have ever fielded. With the hard work came a few more injuries than we would have liked. The goal for next year will be to balance that out a little better. 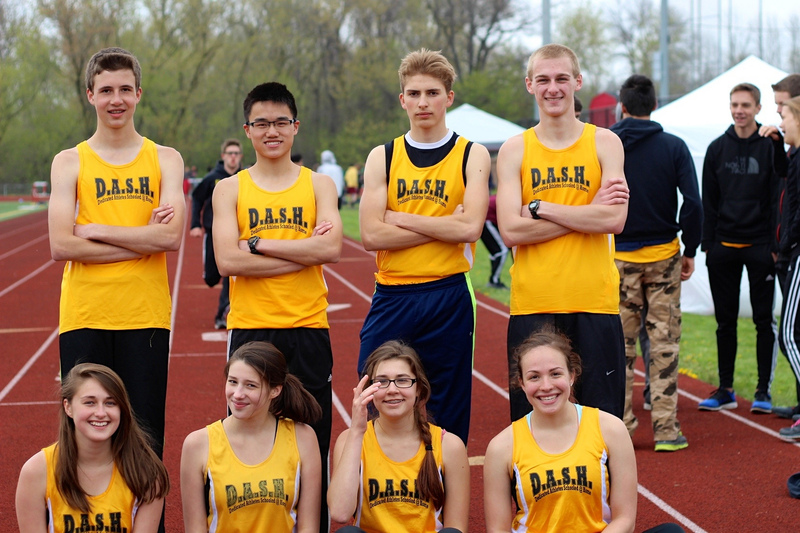 It is sad we will not have our seniors back, which includes long-time DASH stars Justin, Samuel, and Zipporah. But we were a young team, and have a chance to be even better when we ramp it up again next year. I hope to see you there. That is, after an exciting track season this spring. Thanks to Ed Beck, Pete Dickman, and Chuck Maurer for their help with the coaching, and measuring. Thanks to all the parents who stepped up to assist our injured athletes. 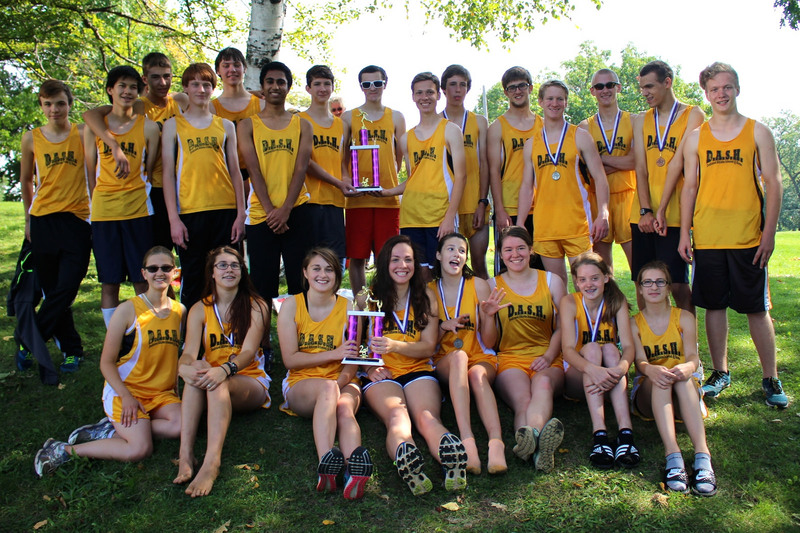 Thanks to our hard-working athletes for putting in all the miles required to excel at a tough sport like cross country. It is time to rest. Thanks to the camera lady, plus Julianna Caspers, Daniel Caspers, Katrina Lipski, and myself for getting the photos. It takes a team effort on this course. Fortunately, we have a great team! 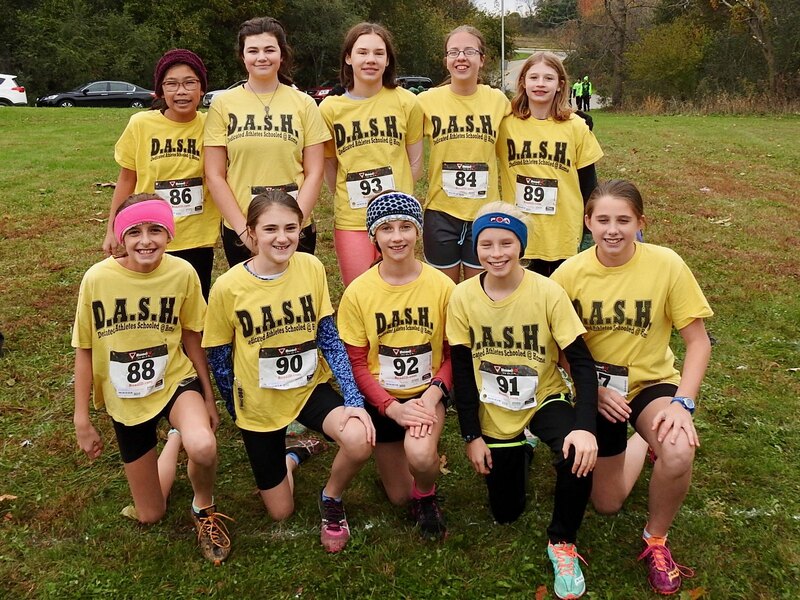 The DASH middle school cross country team ran hard and got dirty yesterday at Greenfield Park, competing in the Warrior Invite hosted by Wisconsin Lutheran College. The course was wet, and the mud was flying with all the recent rain. We would get to see how our team handled the messy conditions, and how they stacked up against the other 25+ teams on hand. With all the grade levels running together, we would have to wait to the end to see how we did in the team scoring. It was time to run your best on the familiar course, and hope the points would fall favorably for us when we were done. The girls were led out by Stephanie Chu. Stephanie got herself in good position near the lead pack before heading into the woods. Stephanie held up well all the way to the finish, and gave us yet another great result – 4th place in the 7th and 8th grade division. Julianna Caspers had her best race of the year. She had that extra spark that she has shown us so many times before, as she matched Stephanie with her own 4th place finish in the 6th grade and under division. Julia Kowalinski was back running fast for us. She gave us a nice 14th place finish. Heidi Talbert did not let the adverse conditions keep her from posting another impressive result as she finished in 22nd place. Joy Rasch has run well each time out, and this time she gave us a much-needed 32nd place finish as our 4th scorer. Savanna Bruton held up well in the slippery conditions, and finished with a nice 13:44 time. Grace Caspers looked very comfortable running fast this time out. She may be ready to push it up another notch next race. Hellena Hacker was able to move up near the end once again, and is putting together a very nice 3rd grade season. Mary LeSac looked strong, and kept up a very nice pace to the end. Alexa Bruton stayed with Mary the whole way in just her first race. Her potential is off the charts, and has the coach wanting to see more. Jenna Walters looked much better this time out. This girls team is very young, and very good. Our top boys all went out fast, and stayed in a close pack, pushing each other and staying near the leaders as they headed into the woods. When they came out of the woods, it was Kaden Hacker who led the way, racing his way to a 6th place medal with his time of 10:36. Joshua LeSac came in right behind Kaden and gave us a second 7th and 8th grade athlete to cheer for at the awards ceremony. DASH yellow jerseys kept heading to the finish in waves as Nathanael Chu and Leif Kostrzewa raced in. 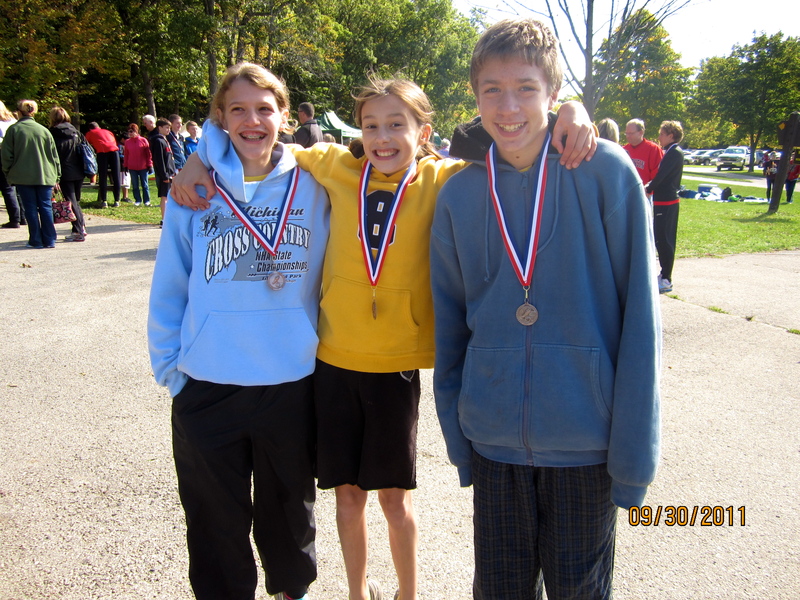 Nathanael and Leif also earned 6th and 7th place medals, theirs in the 6th grade and under division. It was turning into an epic day. Alexander Taylor struggled some in the woods, but overall ran very well and finished 14th overall. Seka Kostrzewa was next. He gave us a 6th athlete with a top-20 finish. Daniel Caspers was our fourth 8th grade scorer. He finished 39th overall with a good effort. Silas Johnson really stayed the course, finishing strong, and hit the finish line just 5 seconds behind Daniel as our fourth 6th grade scorer. We would have to be patient now until after the race when the team scores would be announced to see how we ended up. Joshua Lipski was slowed some by the conditions, but managed a respectable 13:23 time. 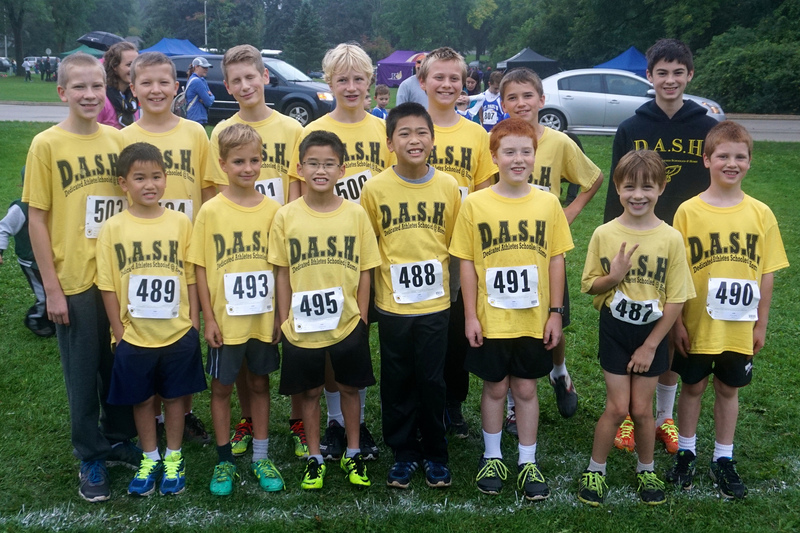 Third grader Josiah Chu had another nice race, finishing 7 seconds behind Joshua. 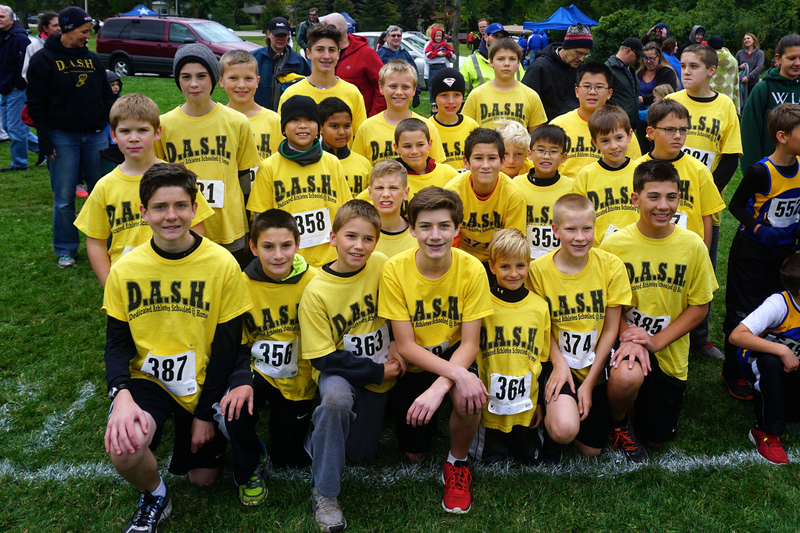 Fellow third grader, Charlie Johnson, made his DASH debut, and stayed close to Josiah the whole way to finish in 13:35. 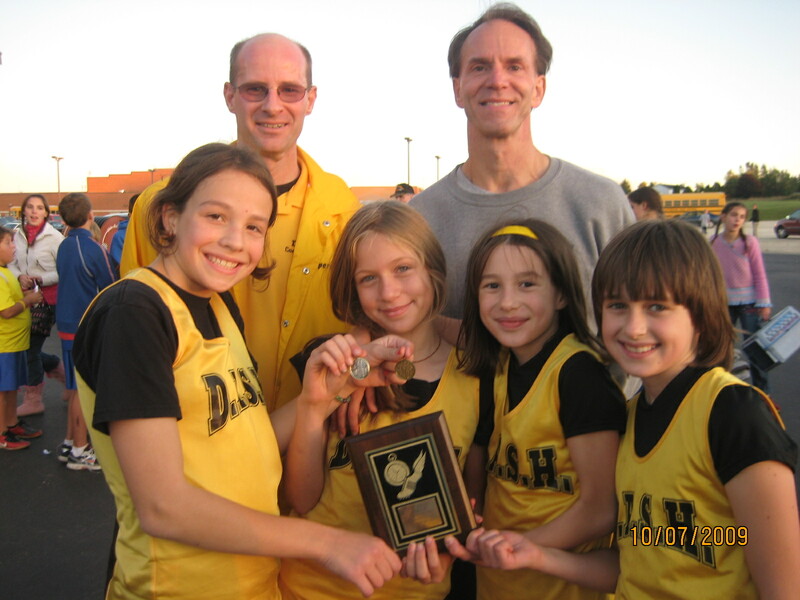 Seka, Josiah, and Charlie are an amazing 3rd grade trio that has the coach dreaming of big things in the years ahead. First grader Noah Caspers proved to be a true mudder. He got plenty dirty, yet looked great as he finished with a very nice 14:16 time. Bryant Farrell edged Micah Chan at the finish to complete an especially memorable day of DASH racing. The girls results were posted before the award ceremony so the DASH fans were ready to cheer for Stephanie and Julianna as they went up to receive their 4th place medals. The 6th and under girls finished in 3rd place overall. They were great. 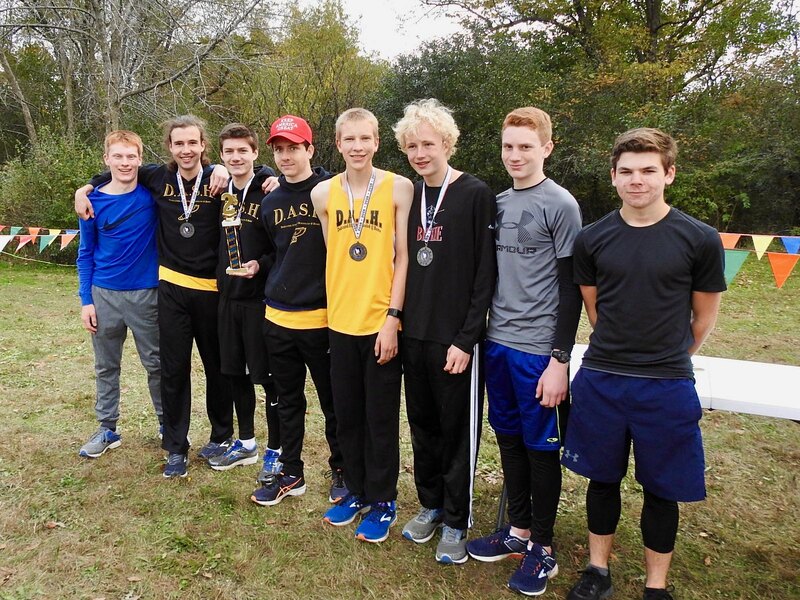 Then the boys results were posted just as the boys awards started to be called out, I peaked at them quickly and saw that we had four boys that made the top-7, so I left and made sure the boys were ready to get their medals and did not get to see the team scores. Leif, Nathanael, Joshua, and Kaden all took their turns to the front to receive their medals. The DASH fans were kept plenty busy and could not have been happier. Then the 6th grade team scores were called out. We were kept in suspense as the teams were called out through third place. We were then told that only 4 points separated the two remaining teams, one of which was us. Alas, we were announced next. Our 49 points left us in 2nd, 19 points ahead of third. Oh, so close! Then the 7th and 8th grade team scores were announced, and we found ourselves in the top-3. The announcer stopped, told us that only 4 points separated the top-3 teams, and then we braced ourselves and hoped for the best. Whitman was called out 3rd with 45 points. Then the announcer told us that only 2 points separated the top-2 teams. 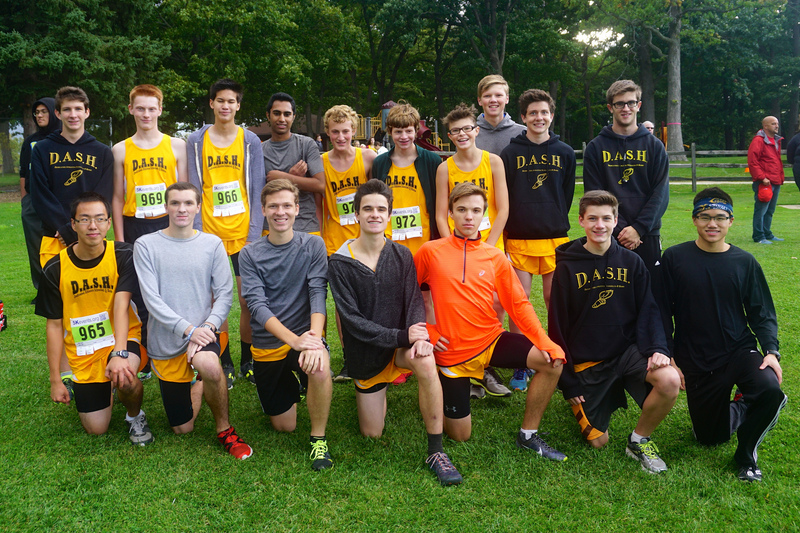 We braced ourselves again, and were happy and disappointed at the same time as our DASH boys were declared the 2nd place team with 43 points, just behind Forest Park. 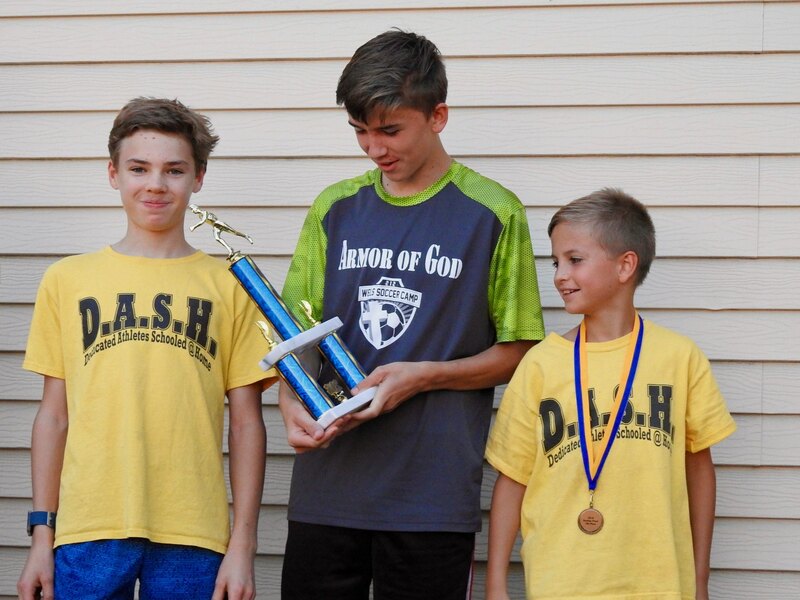 We did not get victory, but taking 2nd place in both boys divisions is an amazing feat that no DASH team has done before. Add in the girls 3rd place finish, and six individual medals, and it truly was an epic performance from the team. What can the team do for an encore? We will see next Wednesday. I hope to see you there. Who wouldn’t want to see them run again? The DASH racing was finished, but then we got to see DASH legend Jacob Dickman race in his first 8k college race. Jacob has never looked stronger as he raced around the ever muddier trail in 28:44 for 13th place overall out of 179 athletes. His team finished in 2nd place. Our middle school boys could relate to that. 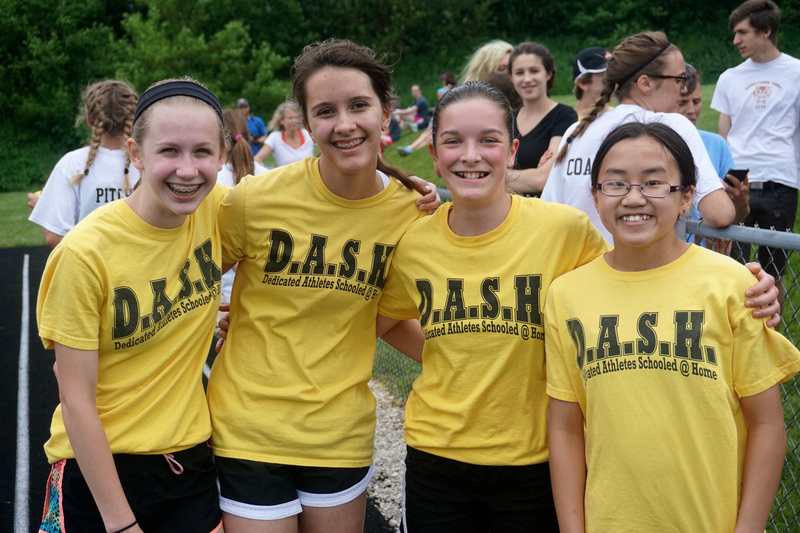 Thanks to the DASH fans that raced around the course to cheer the team on. Thanks to all the parents and athletes who were not scared of a little mud. Thanks to Ed Beck and Pete Dickman for their help with the coaching. Thanks to the camera lady for getting some good photos in tough conditions. Our 7 meets in 14 day swing is coming to a close with just 2 meets remaining. Let’s keep the great results coming.